For N.M., Nuclear Waste May Be Too Hot To Handle Southeastern New Mexico has profited from its low-level nuclear waste depository, hidden in underground salt beds. But as the federal government eyes those salt beds as a candidate to take on higher-level nuclear waste, the state players are debating everything from geology to safety to trust in government. 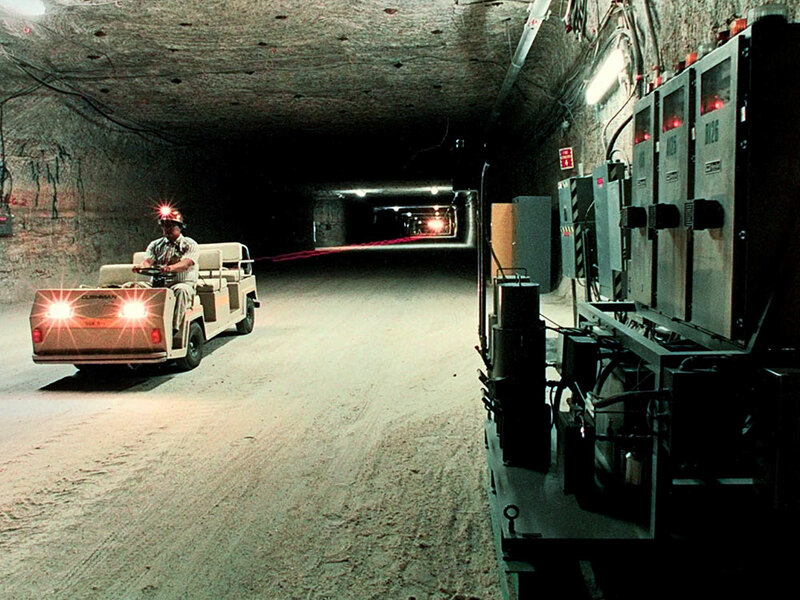 A worker drives an electric cart past air monitoring equipment in a storage room of the Waste Isolation Pilot Plant in Carlsbad, N.M. Tourists in New Mexico know the art galleries of Santa Fe and the ski slopes of Taos, but not the state's truly unique attraction: the Waste Isolation Pilot Plant. The Waste Isolation Pilot Plant, or WIPP, is a series of caverns mined out of underground salt beds. The Department of Energy has been burying "transuranic" waste there for 11 years. The waste includes gloves, equipment and chemicals contaminated -- probably with plutonium -- during the making of nuclear weapons. It's dangerous stuff but fairly easily handled. That's what WIPP was built to take. But the federal government has a lot of other really hot, high-level waste to get rid of -- especially spent fuel from reactors. New Mexico legislator John Heaton says they'll take it. "The geology has been demonstrated that it can actually handle that kind of waste," Heaton says. "In fact, we think that WIPP meets all the requirements that would be necessary for a high-level waste repository." Heaton represents the Carlsbad region of New Mexico. He's seen the town profit from the hundreds of millions of dollars the federal government has spent here to bury transuranic waste. He says expanding WIPP to accept the really hot stuff is not a geological problem. "There's really no other concern except political philosophy," he says. That's not what Don Hancock believes. He's a nuclear analyst with the Southwest Research and Information Center, an environmental group that has monitored WIPP from the start. "It's the geology that doesn't permit it," Hancock says. He cites nearby oil and gas fields, and the fact that the high heat from the spent fuel would attract water from below the salt beds. DOE scientists say the underground water is too far from WIPP to pose a hazard. But spent fuel isn't like the waste that's in WIPP now. It's very hot. Hot enough to change even the nature of the salt and rock. Nuclear analyst Robert Alvarez worked on waste at DOE during the Clinton administration. Congress named Yucca Mountain in Nevada as the candidate site to bury high-level radioactive waste in 1987. The Department of Energy was supposed to start taking responsibility for the waste by 1998. Yucca Mountain would have housed about 77,000 tons of high-level nuclear waste. It never went into operation. Right now, there's no permanent home for high-level waste. Plants need to store their own waste. "The reality is that this stuff is going to continue to build up at these sites for several decades, and it's not going anywhere," says Robert Alvarez, a senior scholar at the Institute for Policy Studies. Yucca has been strongly opposed by Nevada politicians, including Senate Majority Leader Harry Reid. In 2009, President Obama made good on a campaign promise and stopped the Yucca project. Alvarez says that, in addition to political obstacles, Yucca Mountain faced technical issues. One problem: Yucca Mountain is located on a seismically active area. "The amount of heat that this spent fuel gives off is so great that it could actually destabilize the geology," he says, "and cause the containers to corrode or crack open, which would lead to migration of the waste, perhaps into water supplies." Both sides in this debate say the geology favors their view. But Hancock says there's more at issue than just geology. "Spent fuel doesn't show up at any location by immaculate reception," he says. "It has to get there. It has to be transported on roads and railroads that go through other places to where people get no benefits whatsoever out of it." Places like northern New Mexico, where people vote more liberal, more green and more anti-nuclear. In the southeast, where Carlsbad is, attitudes are different. Ron Curry, who runs the state environment department, grew up in the southeast. He says it's a mining culture that's used to living -- and making money -- from risky work. "One of the things that the southeastern part of the state has done, and they've done well, is that they have tried to develop large community support to make them kind of a nuclear alley," Curry says. Curry says people outside the southeast don't see benefits from a "nuclear alley," however. They fear that WIPP is the camel's nose under the tent, that their state will become the dumpsite for the entire nation's nuclear trash. Curry says his department won't allow that. "We've made it clear that WIPP is WIPP," Curry says. "WIPP is for transuranic waste and nothing else. The state has done its part at this point in time. That's kind of our story, and we're sticking to it." But the pressure is on to find a permanent waste dump for more than 55,000 tons of the country's hot-to-handle spent fuel. It was supposed to go to Yucca Mountain in Nevada but President Obama has canceled that project. Alvarez, who watched the Yucca Mountain project collapse at DOE, says the real problem here might not be geology or local politics at all. "What's not there is public trust and the ability of institutions that have the responsibility for these wastes to garner public trust," Alvarez says. "I personally believe that DOE is not the right agency to do this." The president has appointed a special commission to come up with a new plan for a dumpsite. So far, there's no sign that DOE will lose its authority over the nation's nuclear headache.